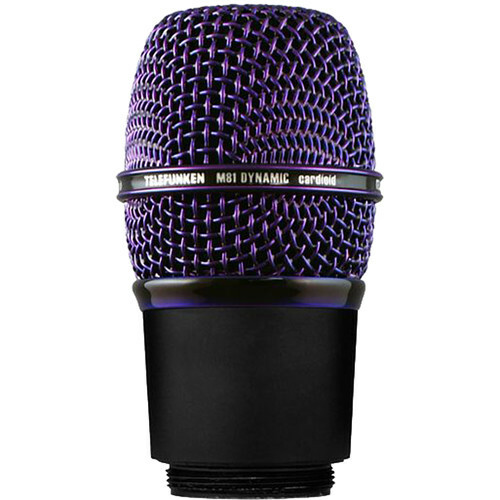 The purple Telefunken M81-WH Wireless Universal Dynamic Microphone Capsule is a screw-on capsule version of the wired handheld M81 microphone. This wireless capsule is intended for use with compatible Shure wireless transmitters (Axient, UHF-R, QLXD, ULXD, ULX, PG, PGXD, SLX, and UR2), Lectrosonics HH and HHa transmitters, and Sony UTX-M03 transmitters. Its tonal character is tuned to soften bright or thin sources and yield a stronger emphasis on midrange clarity. Also contributing to the desirable tone is a custom-wound Telefunken T80 transformer. The supercardioid polar pattern of the M81-WH minimizes feedback, proximity effect, and pickup of off-axis noise.